Being dead doesn't mean you have to give up your wish of getting married to your dream girl, and when the time comes—though you might be a little bloody, bruised, and fiending for flesh—remember that the wedding day isn't just about the bride! Pamper yourself, man. Look your best. And might we suggest some cologne to cover... whatever that is? Fret no more, my ghoulish friend, because, sans fresh scent, we have exactly what you need in this Zombie Groom costume. Despite the dirt, the grime, and the cold, dead stare you keep giving everyone, we think your significant other will still love you just the same—as long as you show up to your wedding wearing this tux that would make Jay Gatsby blush. All included: a luxurious white tux jacket, admittedly a little smoky gray with age… and a little tattered after digging yourself six feet out of the ground… and the tails are pretty jagged. But keep looking at everyone like you want to eat their eyes and no one will gawk at you or your garb. 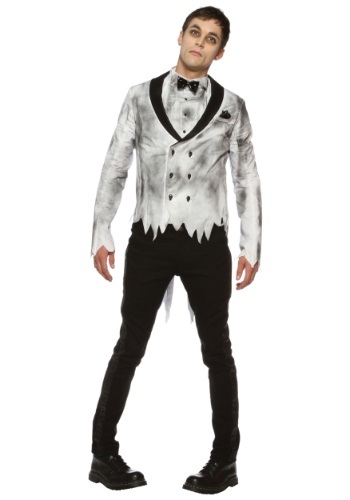 To us, it combines the sensible style of a man about to get married, but conveys the grotesque look befitting of your new commitment to the zombie lifestyle. All you need to do now is grab your bride—out of the bedroom or the ground or whatever—and walk arm in rotting arm down the aisle.